The holidays just got a bit more hassle-free because the Charleston Christmas Tree is all about choice. 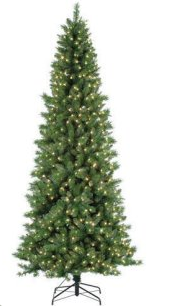 With size options ranging from 5 feet all the way up to 10 feet, this merry tree has a classic medium shape and lush, full tips. It comes pre-lit with clear lights, and some sizes offer a multi-colored light option, too. You'll also receive a metal stand and two-year manufacturer's warranty. How's that for a worry-free holiday? Available in various sizes including; 5 ft, 6.5ft, 7ft, 7.5ft, 9ft, 10ft. We are HUGE FAN'S of Hayneedle.com in our home! With the quality item's, great prices, and amazing customer service, you can't help but LOVE the shopping experience with them each and every time! As such, we were so excited to have the opportunity to review the Charleston Medium Pre-lit Tree from one of Hayneedles online stores, http://www.christmastreesgalore.com/ . It's been a long standing tradition in our house to put up the tree either the day before Thanksgiving or Thanksgiving day (we like to enjoy it for a while since it's so much work to put it up ;) and it stays up through the New Year. 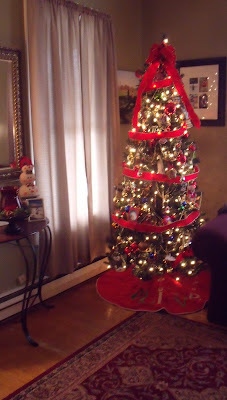 Because we leave the tree up so long, we have had an Artificial Tree for as long as I can remember. Last year I noticed that the bulbs on our old tree were going out a little more frequently, and it just didn't look as spiffy as it had in past years. So, this year I set off to find a new tree! Although I searched through several stores (the prices on some were OUTRAGEOUS to say the least) catalogs, and online, I just couldn't find one that I liked and that would fit in the space that I wanted to put it in. At last I went to Hayneedle.com (where I should have gone first!) and found that they have an entire online store dedicated to Christmas Tree's and decorations! How thrilled were we when the 7.5 ft Charleston Medium Pre-Lit Tree arrived?! I wanted to set it up right away and had to restrain myself for a few weeks (dh would have thought I'd lost my mind if I set it up in October ;). Finally, the day before Thanksgiving we brought all of the decorations out and on Thanksgiving we set everything up (The Charleston Medium Pre Lit Tree All Decorated Pictured Above). This tree is absolutely gorgeous, and the varying needles make it look so real! With the perfect amount of white lights pre-installed, all we had to do was shape the branches, plug it in, and decorate! We had a wonderful time putting it up; I'm sure that this tree will last for years to come and bring our family many happy memories. Looking for that perfect tree this holiday season? Check out http://www.christmastreesgalore.com/ , I'm sure you'll find one that you LOVE at a price that can't be beat! "Variety, Sweet Variety". One Lucky reader will receive a $50 Hayneedle Gift Card! Leave a comment~Visit http://www.hayneedle.com/ and let me know another item that you'd love to gift or receive this Holiday Season. The comment is considered your entry. I'd like the old friend mens leather mocassin. that is what i would love to get! I would get Acorn New Spa Women's Thong Slippers. I entered the Cuisinart Wine Cellar giveaway. I entered the Endless Adventures Table Giveaway. I like Hayneedle on FB - Cari S.